SHARK! Shark Week is almost here! On the Discovery Channel and on two Princess ships! In case you never turn on your television or watch any news, Shark Week is a wildly popular and highly anticipated week each year when the Discovery Channel airs a profusion of shows about sharks. And in case you haven’t been reading your CND or never watch Princess TV commercials, Princess has a partnership with Discovery for the Discovery at Sea program. Thanks to the tie-in, Princess passengers get to celebrate SHARK WEEK! The complete story appeared in the June 19 edition of Cruise News Daily. 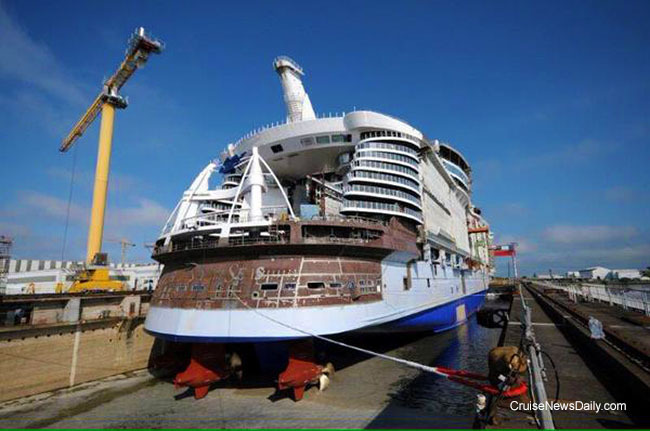 After having its final block put in place earlier this week, and starting the dry dock filling yesterday, Royal Caribbean’s Harmony of the Seas was towed out of its dry dock today at the STX France yard in Saint Nazaire. 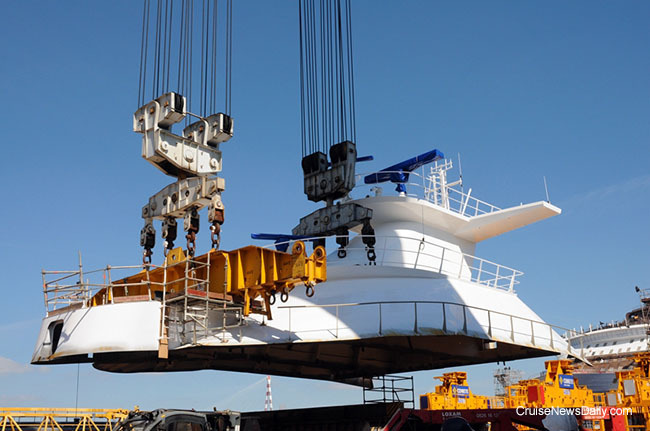 The ship was towed to a finishing dock at the yard where its interior will be completed over the next ten months in time for its April 2016 debut. Harmony of the Seas being docked at the finishing dock at the STX France yard. Carnival Vista is far from complete, as it should be. It doesn’t enter service until next May = almost a year from now. So this is a good time to watch the details of how it’s made. Carnival has assigned journalist Peter Gonzalez to do monthly video updates on the progress, showing details of how each phase of the ship is built. 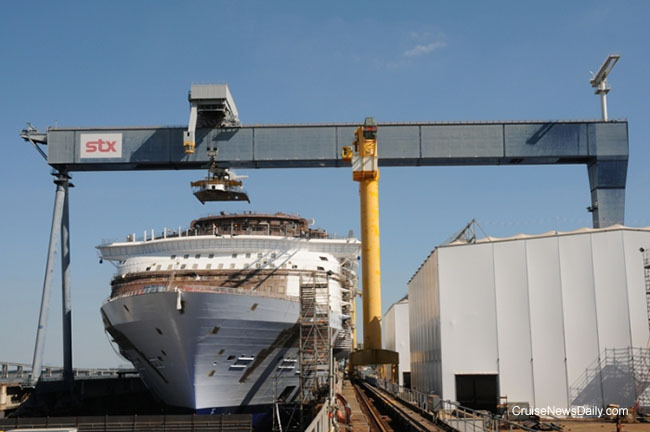 Royal Caribbean's Harmony of the Seas is under construction at STX France in Saint Nazaire, and the ship reached two notable milestones this week. On Tuesday (June 16) the final block was placed on the ship, completing the construction of the hull and superstructure. Then on Thursday (June 18), the dry dock began flooding to float the ship up for its float out over the weekend. Once floated out, it will be moved to a finishing dock where it will remain while the interior is completed. Details appeared in the June 18 edition of Cruise News Daily. In order to better its competitive position at Galveston and Port Canaveral, Carnival is moving some planned changes of hardware forward to April and May of 2016, which they had originally announced for late 2016. The complete story appeared in the June 17 edition of Cruise News Daily. Statendam achieved a coveted perfect score on its June 5 public health inspection, meaning the ship has aced three of the inspections in a row. Details appeared in the June 17 edition of Cruise News Daily. Another line officially canceled their 2016 cruises to nowhere in compliance with new US rules, and over the last few days, the government has been clarifying what they’re thinking (or not thinking). Norwegian Cruise Line canceled three two-night cruises on Norwegian Breakaway from New York in 2016. Passengers will receive refunds of their deposits. Details appeared in the June 16 edition of Cruise News Daily. A member of Norwegian Getaway’s security team saw a woman jump (Norwegian’s word) overboard recently as the ship sailed from Miami to St. Thomas and immediately contacted the bridge. The complete story appeared in the June 16 edition of Cruise News Daily. Seattle, Wash., June 16, 2015 — Holland America Line has promoted Gerald Mosslinger to vice president, food and beverage, as part of the renamed Guest Experience and Product Development Department that was formerly the Marine Hotel Operations Department. The cruise line made the departmental name change to better reflect the department’s core objectives and primary focus. As vice president, food and beverage, Mosslinger will oversee all of the culinary and dining service operations as well as manage all beverage operations for the Holland America Line fleet, including revenue activities, product innovation and service. He will report to Michael Smith, senior vice president, Guest Experience and Product Development, as well as have reporting responsibilities to Paul Goodwin, executive vice president, Onboard Revenue and Port/Shore Operations, for Holland America Group. Mosslinger’s most recent position with Holland America Line was director, beverage and signature services, where he was responsible for all beverage services as well as beverage revenue across the fleet. Prior to joining the company, Mosslinger was with Joachim Splichal’s Patina Restaurant Group based in Los Angeles, Calif., where he served as regional vice president. His relationship with Holland America Line dates to his time as manager, marine hotel operations, for Windstar Cruises when it was owned by Holland America Line. He also spent more than seven years at Seabourn, both ashore in the Miami, Fla., office and aboard the line’s ships. Carnival Corp announced today they have finalized the contracts on four ships they ordered from Meyer Werft for delivery between 2019 and 2022. They are part of the nine ships Carnival announced ordering in March from Fincantieri and Meyer. Along with the announcement of the finalization came a few, but important, details of these ships. A very rare type of maiden call. The complete stories appeared in the June 15 edition of Cruise News Daily. MIAMI, June 15, 2015 – Royal Caribbean International today announced the promotion of Dr. Zinan Liu to the global cruise brand’s President for the China and North Asia Pacific region. Zinan joined Royal Caribbean International in 2009 and has been spearheading all of Royal Caribbean’s commercial and operational activities, and significantly growing the brand in the region, including opening offices in Beijing, Guangzhou and Hong Kong, and bolstering the brand’s operations in Shanghai. Zinan holds a doctoral degree in economics from the University of London, and also is Chairman of Cruise Lines International Association, North Asia, where he has been an influential spokesman for the cruise industry in the region. Today, Royal Caribbean has the largest cruise fleet in China and has won notable awards including Travel Weekly’s China Industry Awards, where it was named the “Best Luxury Cruise Operator” for seven years in a row. 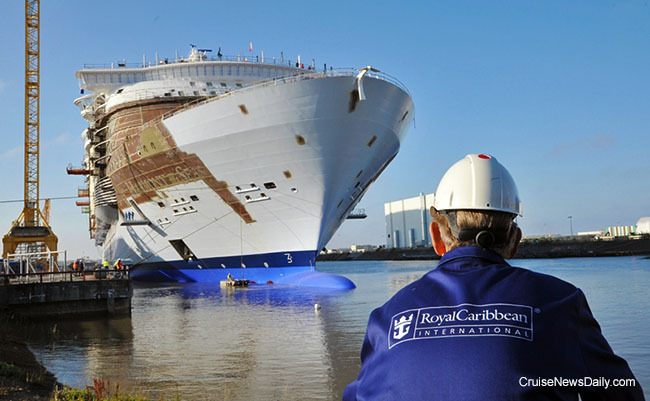 In 2016, Royal Caribbean will have five industry-leading ships in China.